Above, Officer Sokoloski with his barefoot police horse, Shadow, a 4 yo Dutch Warmblood. 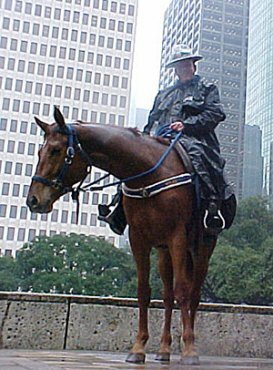 The Houston Police Department started a full time Mounted Unit in 1983 to patrol the Central Business District in Downtown Houston. The unit started with 14 horses and has since grown to 36 horses, covering not only Downtown Houston, but also Memorial and Hermann Parks. The Mounted Unit is also utilized in crowd management, searches, parades, dignitary protection, and other special events where a mounted officer will be needed. 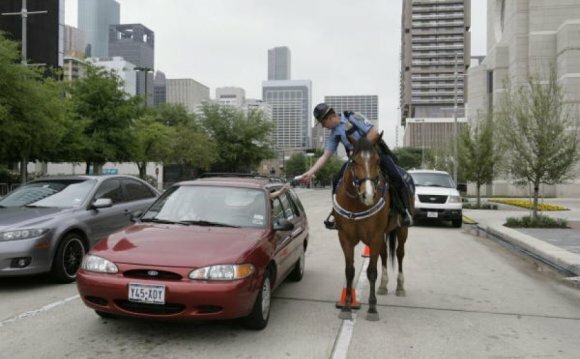 The Houston Police Department currently utilizes 36 horses. There are 30 geldings and 6 mares, ranging in age from 3 to 22 years. The breeds currently used are: 15 Quarter Horses, 8 Percheron crosses, 3 Appendix Quarter Horses, 2 Percherons, 2 Belgian crosses, 1 Dutch Warmblood, 1 Hanoverian, 1 Hackney, 1 Quarter/Arab, 1 Paint, and 1 Thoroughbred. In December, 2003, Darolyn Butler-Dial, (a leading Endurance competitor), and Martha Olivo, hoof care provider, President and Founder of United Horsemanship, conducted a barefoot demo at the Mounted Patrol stables. Using horse cadaver legs, they demonstrated how correct hoof mechanism could enhance the productivity of our Police Horses. My assigned horse, a Dutch Warmblood named Shadow, became the first horse to begin with a barefoot trim. At that time, he was a 4-year-old just starting his career as a police horse. I have been an Officer with the unit since 1983 and have always used horses for police work with borium-tipped metal shoes. After watching Martha Olivos demo using the cadaver leg, I was stunned and fascinated by the importance of hoof mechanism and how some of the injuries and behavioral problems could be due to the constraints of metal shoes. However, I had reservations about riding a police horse in downtown Houston without metal shoes. Darolyn Butler-Dial convinced me, through her experience of riding her endurance horses in 100-mile competitions through all types of terrain, how much healthier her horses were. I then went out to evaluate the performance of a barefoot police horse working full-time on the streets of Houston. Shadow and I began the barefoot journey the week before the Super Bowl, held in our city February 1, 2004. Shadow took two big steps that week; his first time barefoot, and his first time as a police horse. We started work downtown on the Tuesday before the Super Bowl, and worked over all types of different terrain. His traction was excellent, he was confident in every step he took, and there was no wear of his hooves after riding. We started working long shifts on the Thursday before the Super Bowl, to handle the thousands of people in the downtown area and all the festivities associated with the event. Thursday and Friday nights, we worked 14 hours each night. We started to have to move large crowds, handle disturbances, conduct traffic control, and move through large crowds of festive people. Also, we had been getting rain, which made all the surfaces downtown very slippery, along with all the trash that had now covered most of the streets. We moved from scene to scene, through all the wet, trash-filled streets, barefoot and sometimes at a run. This was the point that convinced me that horses could walk and run on the streets barefoot. On Saturday morning, Shadow was showing signs of soreness, but not lameness. Martha and Darloyn both explained to me that this could occur, and hoof boots should help. I picked up a set of Old Mac's Boots from Darolyn. Saturday and Sunday were both 14 hour days, and Shadow never showed any more signs of soreness in the Old Macs. We again worked through thousands of festive people, over all sorts of varying road conditions. The Old Macs performed flawlessly, and again this convinced me that barefoot was the way to go, even if there was an occasional need for hoof boots. Throughout the week, Shadow was monitored and evaluated by other Supervisors in the Mounted Unit. Shadow had worked every day of the Super Bowl barefoot, and never had any problems without shoes, or working in hoof boots. This convinced the administration there might be a need to move forward with additional police horses going barefoot. The City sent me to Martha Olivos 2 week Hoof Groom Course shortly after that. The funding for the school was donated by others wanting the education, and to see additional police horses go barefoot. I spent 2 weeks with Martha and other students, trimming and dissecting cadaver feet, getting schooled on proper hoof mechanism, evaluating and mapping hooves, treating lameness in horses, and proper trimming techniques. After the 2 week Hoof Groom Course,  I continued with Shadow. My first police horse to take barefoot after Shadow was Barney. He had been chronically lame and abscessing since November, 2003. I evaluated Barney and pulled his shoes in February, 2004. I found excessive bar that had covered the entire bottom of the sole. I trimmed the bar, and started to balance his hooves. He has since not been lame, and continues to be barefoot as a police horse. Since Shadow and Barney, I have taken an additional 9 horses into the Barefoot Program. Most of the horses in the program are horses that have had physical problems which have now been alleviated with a correct trim. Each additional horse that is taken into the barefoot program will have their hooves photographed and measured. Their progress will be evaluated each week by the Officer assigned to that horse. I am now trimming the horses that have been in the program about every 2 weeks. I am currently working on a Quarter/Arab mare that had very contracted hooves. She is now downtown, barefoot, and doing very well.